The wait is over as one of TV's greatest Westerns returns for a spectacular third season. 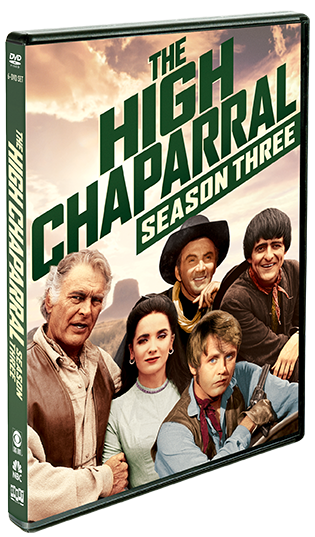 The charismatic Cannons (Leif Erickson, Cameron Mitchell, Mark Slade) and magnificent Montoyas (Henry Darrow, Linda Cristal, Frank Silvera), as well as the often irrepressible Bunkhouse Gang led by the Butler brothers (Don Collier and Robert Hoy), are back with The High Chaparral: Season 3, now on DVD for the first time. Again under the guiding hand of Executive Producer David Dortort, the legendary series' stand-out episodes and roster of great guest stars include "A Time to Laugh, a Time to Cry" (Donna Baccala), "Bad Day for a Bad Man" (Malachi Throne, Marianna Hill), "Alliance" (Robert Viharo, X Brands), "Friends and Partners" (Charles Dierkop), "Jelks" (Mitchell Ryan), and "The Long Shadow" (Gregory Sierra, Richard Farnsworth). 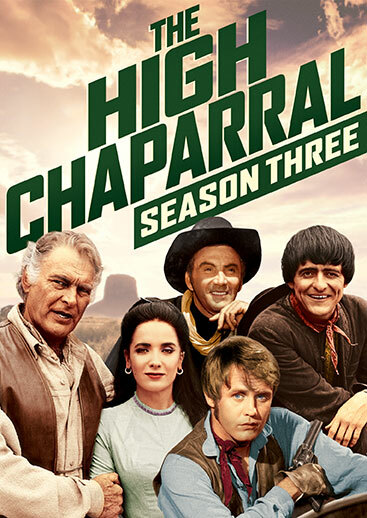 Digitally remastered and restored from original film elements for superior sound and picture, each episode contains footage filmed on location in the magnificent desert of Old Tucson, Arizona, as well as an alternate Latin American Spanish language track.